Most of the common Levaquin side effects are gastrointestinal, and may include nausea, diarrhea, constipation, vomiting, and gas. Other side effects include headache, dizziness, or muscle weakness. The long list of serious side effects ranges from tendon rupture and tendinitis (accompanied by muscle pain, swelling, and stiffness) to seizure, paranoia, anxiety, jaundice, loss of appetite, and hallucinations. If these side effects persist, it is important to contact a physician immediately, as the symptoms may be a sign of a more serious adverse reaction. 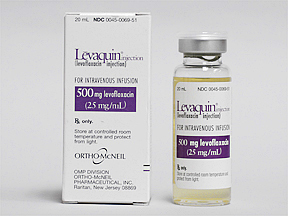 In 2009, the FDA required that the tendonitis and tendon rupture side effects be listed as a “black box warning” prominently on the packaging for Levaquin. This warning indicates that those taking the drug face a significant risk of developing these adverse effects. For the most part, men and women are susceptible to the same list of side effects associated with this drug. However, some women may also experience vaginal discharge or itching around the vaginal area as a result of taking Levaquin. Additionally, women who are pregnant or nursing are cautioned not to take Levaquin, as it may be transferred to the fetus or newborn. This can cause birth defects or miscarriage during the gestational stage, and developmental problems in neonates who receive traces of the drug in breast milk. Children are particularly susceptible to joint pain and tendonitis, so it is not recommended that children under 18 years old take Levaquin unless it is absolutely necessary (for example, if they have been exposed to airborne anthrax and at risk of infection, for which there are few preventative measures). In fact, the drug itself is not officially approved for use in pediatric care, since a recent study indicated that in small children, Levaquin may lead to musculoskeletal disorders, and could be fatal. Overall, children have an over 50% chance of experiencing a serious reaction to the drug. A small percentage of people report weight gain after starting treatment with this particular antibiotic. However, this is not generally considered to be one of the direct side effects of Levaquin, and is typically attributed by physicians to a combination of other lifestyle factors. Weight loss may sometimes be a side effect of taking the drug, most often when a patient experiences other side effects like appetite loss and nausea. The potency of Levaquin makes it a more volatile antibiotic, with a longer list of side effects than most other drugs in its class. While the drug should be avoided by children and women who are pregnant or nursing, it has been approved safe for use by the FDA for adult men and women suffering from serious infections. However, patients should be closely monitored after initial administration to ensure that they do not develop one of the serious side effects.